Have you been to a Burger King restaurant lately? If so, you might have noticed some slight changes in the design and content of the menu. Since the restaurant was bought out about two years ago, it has been trying to repackage itself as a high-end, classy gourmet hamburger destination. Instead of just a place where you can get a huge, sloppy burger and fries at the drive through. A whopper, medium fry, medium Coke, and bacon ice cream: just 1,780 calories. Garden Fresh Caesar salad with tendercrisp chicken, Southern style sweet tea, and bacon ice cream: just 1,480 calories. Oops. Okay, maybe the bacon ice cream just really pushes any meal over the limit. It’s not surprising, considering it packs 510 calories. You can eat an entire meal at home and not hit that amount. We can only assume that the folks at Burger King are missing the customers that used to come in for a double whopper with cheese, a large fry, and a Diet Coke. 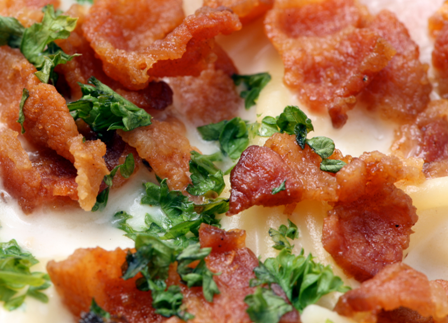 Why not wash that meal down with some bacon ice cream, too? Your total calorie intake would be just 2,000 calories. Here’s a better choice: Mix up your own batch of this current fad at home, then enjoy it after a somewhat less heavy meal! You can find a great sweet and salty bacon ice cream recipe on our website, as well as many other less novel but still delicious flavors. Are you headed out to Burger King as soon as this new dessert hits the restaurant near you? If so, we’d love to hear what you think of it. Post your thoughts below—unless you’re so full afterward that you can’t do anything but go straight to bed.